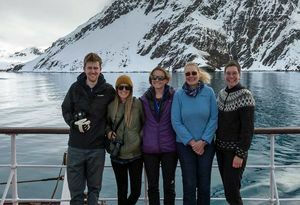 In early October the museum team set out from diverse origins (Scotland, Devon Germany and Australia), meeting up in the Falklands for the onward sea journey to South Georgia. 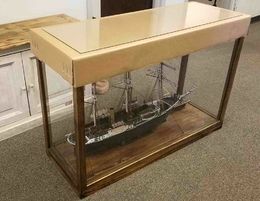 Also setting out at the same time from another Georgia, Georgia USA, was a scale model of Shackleton’s ship Endurance that has been made and donated by Ken Greenwood. 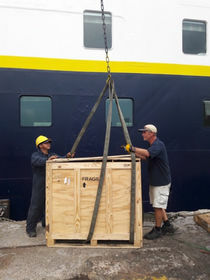 The delicate model, complete with glass case, was carefully packed and then shipped to Panama where it was loaded aboard the expedition cruise vessel National Geographic Explorer who delivered it to Grytviken on the last day of the month. With the ship at anchor, hearts skipped a beat as the substantial case was lowered into an inflatable Zodiak then driven to the jetty, lifted out on a forklift and moved into the biosecurity shed. One of the first jobs of November then will be unpack and check how well it has travelled. Fingers crossed. With a week and a half from arrival on island to the first cruise ship visit, we were kept busy with the usual unpacking and biosecuring of cargo, replacing museum items that had been stored for the winter, putting out the signage around the whaling station and stocking the gift shop with all the lovely new lines. 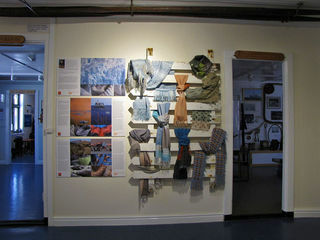 ‘Scarf stories from Antarctica’ is an exhibition of textiles inspired by the region by Alison Stattersfield. The eight featured scarves were woven by hand on an eight-shaft table loom using yarns such as silk, wool, alpaca, mohair, cotton, Tencel and monofilament. 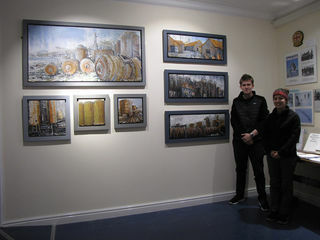 To accompany the exhibition a small number of scarves were manufactured by one of the UK’s foremost weavers Stephen Walters and Son Ltd in fine wools and cotton that are on sale in the Gift Shop. Last season’s Curator, Charlotte Yeung, was on the island a few weeks earlier than the rest of us. Indeed their ship had to wait for two days as the ice was too thick on the cove for it to be able to get in. 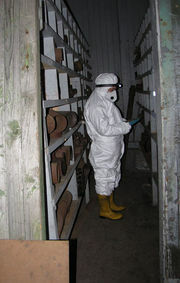 She was accompanying a group of specialist cleaners removing historic dust from the Main Store. 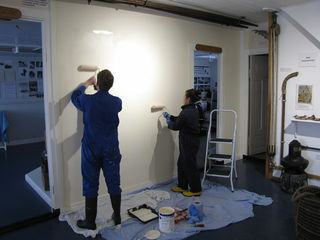 Her role, to oversee handling of the original whaling artefacts that crowd the shelves in the store, and to catalogue the many thousands of artefacts as we work with GSGSSI towards opening the building for visitors in the future. This page was last modified 19:28, 2 November 2018. This page has been accessed 784 times.